Day three has come to a close. 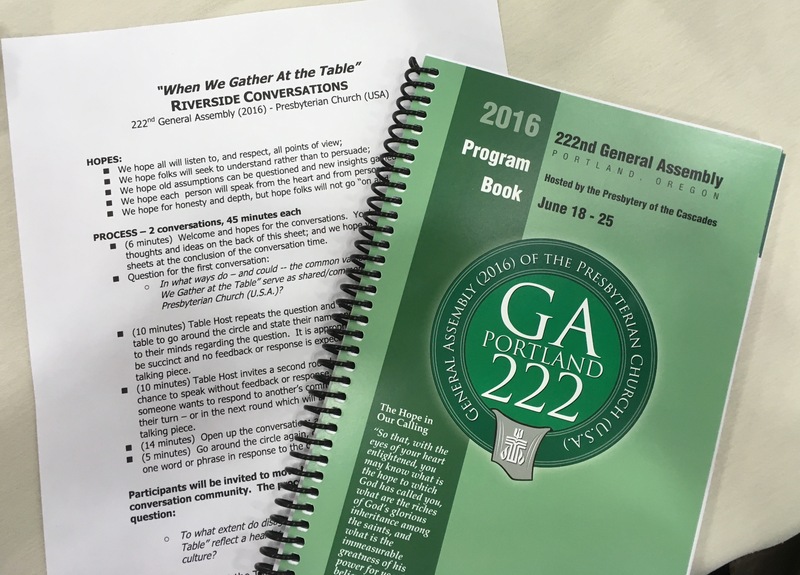 The work of the 222nd General Assembly of the Presbyterian Church (USA) is commencing in earnest. The Commissioners and Young Adult Advisor Delegate (YAAD) from Lehigh Presbytery here in Portland, OR are Don Brown, Tim Dooner, Mary Lazar, Paul Lucia and Alicia Shussett. In our short time here we have attended worship in local congregations, found ourselves in the midst of Pride celebrations, experienced a moving opening worship for our Plenary proceedings, learned more about the many ministries of the church, celebrated 300 years of the Board of Pensions, attended our first day of committee meetings, actually accomplished some business and snuck in some time to enjoy some of what Portlandia has to offer. The biggest news of the deliberations thus far is the election on the first ballot of the co-moderators. Jan Edmiston and Denise Anderson were overwhelmingly elected to lead the church for the next two years. There is a palpable excitement about the vision and leadership these women will bring to the church. 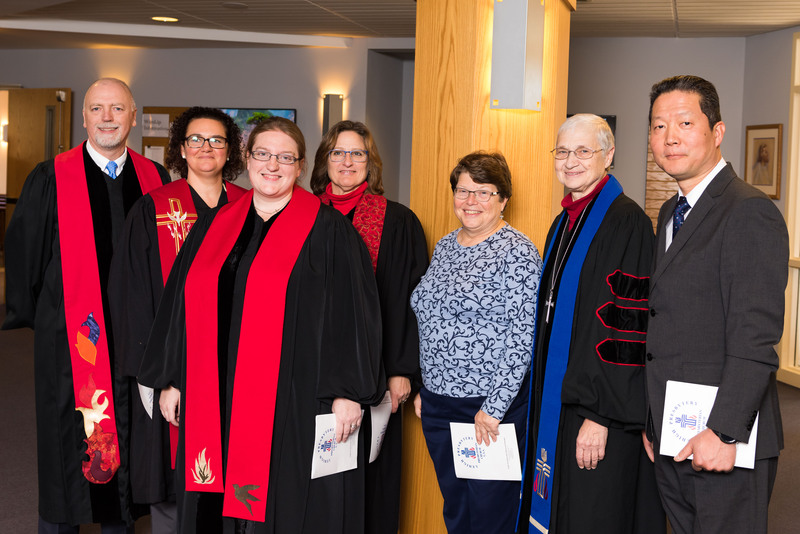 It was indeed timely that they were elected on the 60th anniversary of the ordination of women to the word and sacrament in the Presbyterian Church. There is much hope for the church and God is still calling us. Please pray for our work and that we heed the call. Grace to you all, and peace. It is with a mixture of deep sadness and great joy that I write to you to share the news that I have resigned from the position of Teaching Presbyter in order to accept a pastoral appointment in the area. This decision did not come easily for me, nor was it made lightly. However, it is something that I joyfully and gratefully receive as a gift of God. Lehigh Presbytery is in the midst of some difficult realities, many of which mirror not only the denomination, but also the western Church as a whole. I never once lost faith that God is at work in the churches that give Lehigh Presbytery its very being, and the Presbytery Lead Team, of which I am a part, has desired to be responsive not only to the challenges, but also receptive of the opportunities. But like many presbyteries and churches, we have found it difficult to get our arms around how to do this. Honest conversations have been held, honest questions asked, and more are needed. In the midst of this, in a routine moment when it would have been so easy to miss God’s desire, God was relentless. Last fall, as I half-listened to a devotional podcast, I entirely missed the Scripture passage, but I knew I had to hear it. I played it again, then a third time. “That night [Jesus] appeared to Paul: “It’s going to be all right. Everything is going to turn out for the best. You’ve been a good witness for me here in Jerusalem. Now you’re going to be my witness in Rome!” (Acts 23:11, The Message). With that, I knew that while I could still contribute to our life together in Lehigh, it was okay for me to consider other places where I could contribute to God’s kingdom. With utter amazement and stunned gratitude, I am able to tell you that I have accepted an appointment as pastor of St. Paul’s Lutheran Church in Allentown, beginning July 1st. No, I have not left the Presbyterian Church (USA)! Rather, since 1997 four denominations have had a partnership, “The Formula of Agreement,” that was forged out of longstanding ecumenical discussion. In this, we allow the “orderly exchange of ministers” in a way that we have most frequently seen in our area with United Church of Christ partners. Under this agreement I will remain a PC(USA) pastor, with dual standing in the Evangelical Lutheran Church of America (ELCA). Because I will remain in the area, I will still be under the authority of Lehigh Presbytery. This has been such an unexpected meeting of gifts and desires between the church and me that I have to believe it is God-orchestrated. As the situation unfolded, it was remarkably evident how God was using this call in a multitude of ways — revealing to me the economy of God’s grace in a wonderfully unexpected way. Unanticipated though it may be, God is addressing my call not only as a pastor, but also as a husband and a father. Alicia, Rachel, and Daniel share in the joy of this new beginning for all of us. I am in conversation with the Synod of the Trinity and Presbytery leadership on how my transition out of the Teaching Presbyter role can happen most helpfully, and how I can remain a part of the Presbytery most healthfully. Like a pastor leaving a congregation, I know that good and healthy boundaries are best for all of us. 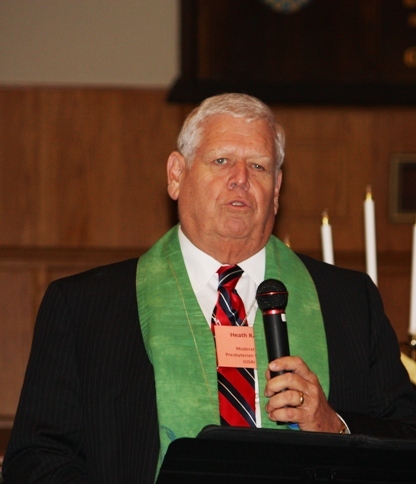 I am glad to say that I will be attending the June 23rd presbytery meeting in Slatington. I wish it were possible for me to visit each of the Presbytery’s congregations one more time, to see the many friends I have made over the years and worked alongside in a variety of ways. I would love to share one last smile, handshake, or hug. We did not always see eye to eye on things, but so many of us could still look each other in the eye, with respect and affection if not agreement. That is what it is to be the Body of Christ. There is so much more I could say. I will leave this ministry with many fond memories, many learnings, and many, many friends. Most of all, I leave with renewed conviction and confidence, that for us and for the world, God is indeed, all in all. It is my pleasure to offer to you a reflection of what I have seen and heard across our church during the 10 months since I was elected moderator. First, let me begin with some of the very positive reflections. We are a safe place where these young people can come and search for their faith identities. They can ask questions and seek answers and pursue deeper understandings of the faith without fear of judgment or feeling they shouldn’t have questions. They say the Presbyterian Church embodies the teachings of Jesus who taught us to love one another and respect one another. They say that we are a church without walls. Over and over, they say that we are a place where they can live out their faith. They don’t have to be in church every Sunday, but they are not going to let down the feeding programs for the poor when they are scheduled to be there. They may take a hike instead of attending worship on some Sundays, but they know they will come back and be fed and then be equipped to go into the world as living servants of Jesus. They say that we care for all of God’s children—regardless of race, creed, or gender issues. They do not all agree with gay marriage, but they say that being a part of a denomination that allows for them to have different opinions models the love of Christ, which they believe is true and is not hypocritical—a trait many of them have found in other denominations. Let me hasten to add that I see and hear about this phenomenon in urban areas. Rural areas are not having the same experience. But rural areas are also working hard to keep young adults living in their towns and communities, because they are choosing to leave in large numbers. So my first question to us as a Presbyterian Mission Agency board and staff is, How are we going to address this new influx of dynamic Christians? How can we serve them in ways that will enhance their effectiveness and undergird their excitement as PC(USA) members? We are often criticized by many outside our church as not believing in the authority of the Scriptures and not accepting Jesus as our only path to salvation. I have preached on these two matters almost every time I have occupied a pulpit. And I want to simply say two things: both of those are untrue and almost blasphemous accusations about the PC(USA). First of all, there is not a teaching or ruling elder who is ordained in our denomination who does not have to answer the question in the affirmative—Do you accept the Bible as the authoritative Word of God?—or some similarly worded statement that means the same thing. If they cannot say they do, they are not ordained. To say the PC(USA) does not believe that is a lie. It is sad that people who want to harm us have used this untruth to lead many people who are less informed about such matters to turn against us. The other main theological question I am asked is if we believe in Jesus Christ as our sole means to salvation. Again, the answer is blatantly obvious. One cannot join a church in our denomination without answering the question in the affirmative that she or he believes in Jesus Christ as Lord and Savior. If you do not, you cannot be a member in our churches. And I have not met one single person—member or officer of our church—who does not believe that as truth. There has been a campaign of hate and divisiveness built against us. And it is not a true reflection of our particular body of Christ. Question number two: How do we undergird the basic theological and faithful principles of our church in a way that lets the world know the truth about who we are? Nothing, absolutely nothing, is more important to members of the PC(USA) than the acceptance of and love for Jesus Christ. The third area I want to mention is related to our witness to Christ around the world. Our global missions program is still extraordinary. I have had the chance to sit with and watch our mission coworkers in nine countries outside of the United States during these 10 months. Their faithfulness and love and compassion, as well as their commitment to the faith and our denomination, and particularly to the wonderful people they are serving, is remarkable. We are extraordinarily blessed with these people, and they deserve increased support and affirmation as they live and work in areas where their very lives are under fire. Our mission partners in other countries love and affirm our work in their midst. Not only are they grateful for our past service, but they are eager for us to continue to work with them to build up their churches. So, question number three: What can we do to help, as a board, to undergird these precious, long-standing, and devoted relationships with church bodies around the world? How can we impress on our denomination the significant impact we are having in addressing issues of world peace and compassion? The Presbyterians who are breaking off from us and becoming other denominations do not have the same history of relationships and long-term bonds of love. Nor do they have the networks and relationships with both the governments and the churches that we have developed. They are losing a huge advantage in their efforts to make a difference around the world. We cannot let our partner churches down. We also must find the resources needed to enable our mission coworkers to continue. How can we do that? The fourth will be brief but needs to be shared. Our church offices in New York City, with the United Nations, and in Washington, D.C., are huge factors in living out the faith by promoting worldwide peace and justice, the critical issues that Christ called us to pursue. In New York, I was told by numerous other faith communities that our UN office is the standard that they choose to emulate. Our staff and work there not only serves our denomination but is the model used by other Christian communities when it comes to being aware of, and responding to, issues around the world which impact God’s children. Likewise, in D.C., when I went to the White House, I was informed by so many people from other church communities and nonprofits that we are the denomination that brings the message of Jesus into the realities of policies and projects being undertaken by our government. In fact, one person tearfully reminded me that had it not been for the PC(USA), both the original act and the extension of the Civil Rights Act would not have been legalized. Question number four: How can we undergird the ministries of these areas across the denomination? 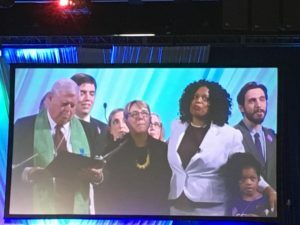 I find that our membership at large does not realize that as Presbyterians we have a formative voice in both national and international matters—a voice that lifts up the love of Christ and upholds the human dignity of our sisters and brothers. The fifth matter I wish to address is our relationship to the Jewish community in the United States. After our vote last summer on divestment, this became the number one issue on my plate, as well as the greatest topic of conversation around the church. In our effort to stand up for the humane treatment of Palestinians, we lost trust with our local and national Jewish communities. There are lots of issues related to this. It is a complex and challenging matter we have undertaken. I am not here today to debate the pros and cons of the divestment decision, as that is not the role of the moderator. But I can tell you that I have worked hard to communicate with both our Jewish friends and our Palestinian support groups, to see how we might communicate in ways that will uphold the dignity and strong anxieties which both bodies have—and I might add that I believe both groups are legitimate in their fears. Dialogue is critical. I am aware of conversations in so many communities where Presbyterian churches have come together to explore the issues and have found the conversations to be very helpful. I have had very meaningful meetings with the Israel/Palestine Mission Network and with Jewish rabbis. In fact, in a few weeks, and with the blessing of Gradye Parsons, who is our primary communicator in such matters, Rabbi Rick Jacobs, who is in many ways the titular head of the Jewish faith community in the United States, and I are inviting a group of about 30 Presbyterian ministers and Jewish rabbis from across the United States to meet together in a private conversation to discuss ways that we might continue some form of reconciliation. This matter will continue to raise its head at our General Assemblies and will likely continue to be divisive. So my fifth question is, What should we as a board do to help bring some degree of reconciliation to the peoples with whom we relate? Obviously, we cannot control the Israeli government or the Palestinians, but what guidance might we provide our denomination so it can look at ways to move forward in directions that would be more conciliatory? Number six is related to gay-marriage issues. Yes, whereas our decisions have been liberating and celebrated by some, they are painful and heartbreaking for others. But I am no longer seeing this as the defining issue of our church. Even in many churches where they have been quite divided, I am hearing members say they are tired of the fight, they are tired of being identified as a one-issue church, and they want to move on—as members of the PC(USA). I am aware of two very significant churches in Texas that were identified by many as two of five major churches in Texas that would be leaving the denomination. They were offered support and assistance to help them in this venture. But in the past few weeks they have stated that they are no longer going to be divided over this matter, and they have called dynamic pastors to lead them in ways that might make them be more strongly aligned with the denomination. Whereas there are still some churches that are considering leaving us, more and more I am hearing of those deciding to stay because what we offer as faithful followers of Christ is far greater than some of the issues that have been dividing us. So, question number six: Now that it appears likely that the major storm of separation and upset over gay-marriage issues may be diminishing, what do we do to bring back the harmony we need and should expect as one body? I would say that we still need to interpret what we have done. We need to undergird that in this “big tent” we call the PC(USA), there is room for us to disagree in love and not be afraid that alternative positions will be crammed down our throats. People are not being asked to betray their conscience. Grace has been a hallmark of the Presbyterian Church throughout our history. And grace will continue to be a huge part of our DNA. My seventh issue is related to communications. It was my honor and pleasure to retreat for several days with the six communication directors of our six denominational agencies. They are talented and competent people. They recognize that our denomination is seeking a coherent message. We don’t have a website that is working for us like we need. We hear from six different agencies about our work, but who is telling the story of the PC(USA)? Do we need a brand, something that could be a handle that would help to identify us in a way that shares who we are? Another way that question is being asked is: “I don’t know how to tell someone in a few sentences who I am as a Presbyterian. It is complicated. Can it be put into some simple statement that could then be elaborated on?” I would propose that for the next few years we might need to put greater emphasis on communicating than any other facet of our church. Churches want to know better ways to share their successes and ask questions of one another. They want to be able to ask which other churches have faced the same issues they are now facing and how they resolved those matters. People also want to know what the denomination has to offer on various topics and issues. In many ways, people are looking to our denominational offices to be the conveyers of information and not necessarily the instigators of new ideas. In many ways, that has been identified by our staff here as their new role. But we need to find new ways to communicate in a society that is focused on communications like it has never been before. So, question number seven: What can we do to enhance communications between and among all constituents in the PC(USA)? What can we do about funding? When our Foundation is growing so well and our pension plan is financially secure (and everyone thanks God for both of those successes), why are our programmatic funds not also increasing? We have an excellent team of people raising money on many different levels. This is not a criticism of their work. But we are far short of what we need. Many people suggest to me that it is related to communication and the fact that people are not clear on what they should, can, and actually do give their money to support. Are we competing with ourselves? Should we embark on even greater efforts to raise the funds needed? Are there funds that should be redirected? Are we trying to do too much? In our Presbyterian Mission Agency board, we have asked our leadership to enact major changes in our budgets, which have resulted in huge cutbacks in order to be more efficient, while seeking to minimize cuts to services that the church needs to continue. But is the overall model of current funding for our whole denomination the best one? So, question number eight: What can we do to increase financial resources for our programs and operations, which would more effectively undergird our work? And now for my last point. There is a lot of conversation at various levels of our church about how we function as a PC(USA) organization. The basic question I am asked in different ways over and over is, Is the PC(USA) set up to function in the most effective way to meet the needs of our denomination in 2015? And most of these people say no. These people are not the general pew sitters in our churches—those folk who care mainly about what is happening in their local church and want to know how to impact their local communities more effectively in the name of Jesus. But for those who do care, at the General Assembly level there is a growing interest and concern about the way we operate at the assembly. Many of you know that there is a movement to explore ways to redesign our process for governing the church. We are seeing overtures from Foothills Presbytery that are calling for us to look anew at how we do business. We have people expressing concern that our wonderful democratic process of government can also be a liability when it comes to making a decision. It is felt that we have to wait too long for some decisions and that our emphasis on voting becomes our identification. It is said that “to vote” means to “divide the house” and that Presbyterians spend too much time dividing themselves from one another rather than looking at ways to build the church together. We are currently exploring the role of synods. I don’t need to expand on issues being raised concerning that level of governing body, but we do need to include it as part of a much greater concern about our overall priorities. And what about presbyteries? Recently, I heard these statistics from Sue Krummel: We have 171 total presbyteries. Thirty-four of them have no executive presbyter and most have eliminated the position. Another 34 have interim leaders. Thirty have a person serving both the role of stated clerk and executive as a dual role. Seven have someone sitting in the seat that used to be for the executive—but the role is now quite different. That means 105 of our 171 presbyteries do not have the traditional model of stated clerk and executive, the model we have used for so many years. And the negative impact of this is multifold, not the least of which is that the traditional avenue for communications across our denomination is no longer in place. It is interesting to note that stated clerks are required, so they are everywhere. We need to realize that the current structure for this was put into place 45 years ago, and demographics were different. People had much more faith in institutions then, and now there is suspicion and much concern about all institutions—religious or otherwise—in our nation. We hear a great deal of conversation about “Louisville”—almost as if it is an entity unto itself. Things have been tough there. We continue to expect our staff to do everything they did when we had 5 million members and one-third more staff and money. It isn’t fair, but the system needs to be changed. What can we do to help create a new system that will change the church in ways that are needed? My personal assessment is that we must spend time in setting our priorities as the Presbyterian Mission Agency and as a denomination. Does the structure need to change? All evidence says yes. But we can’t change effectively until we know our priorities. For us, the Presbyterian Mission Agency, we are the operation that is most criticized. In some ways that could be expected, for so much of the “work” of the church falls under our umbrella and we are the most visible. If people don’t like something about the church, often it is because of some direction our programs are going, and that is usually related to us. I have tried to listen carefully, and I am hearing three primary streams of thought. The first one is from what I would call “insiders”—people in the church who focus on matters of church structure and operations. I do not find these dynamics to be focused upon by most people in the pews, unless pastors or some other folks to whom I am referring as “insiders” encourage them to do so. Of the ones I have been hearing, there seems to be confusion and dissatisfaction with our board as well as with our staff. Here are the three sets of opinions I am hearing most often concerning the Presbyterian Mission Agency, and they are not in order of priority. All are perceived as problems. That Louisville staff are not handling their administrative roles as carefully as they should, resulting in unnecessary problems and concerns. There is the feeling on the part of some that we need to hold people responsible who have made poor decisions. There is also a sentiment that our board, the Presbyterian Mission Agency board, is not functioning effectively. Marilyn, I have not heard this directed to you, nor Jo, so please don’t take this personally. In fact, I have heard you praised. I would have pulled you aside and shared it with you confidentially if that had not been the case. But what I have heard is that the other five boards of our organization respect confidentiality, are collegial to one another and to the staffs that work for them, but that there is dissent among the mission agency’s board membership. Some people in the church seem to know our confidential business when they shouldn’t. They say that we go out and talk about our problems rather than working with each other to fix them. There is also a feeling that we have some on our board who are vying for power and position and using board membership to place themselves in positions of being appointed to major leadership roles or even in seeking paid positions. In fact, one example that I heard in Nebraska two weeks ago was that the very issue we are talking about today—namely, the report of the 1001 misuse of funds, is being debated by our board in unhealthy ways. I don’t know where they got such information. Some say, quite bluntly, that Linda should have managed this better. Others who believe that may have been the case early on, say they believe that the board is the one who made the decision to have this study done, without Linda’s input, and therefore the almost certain negative reaction to what will likely be extraordinary expenses should be addressed to the board—and the church should be told that we did it—not management. So there is a lot of tongue wagging about our board and whether or not we need to reexamine how we handle our role. The saddest part of this is the rumor I have heard from New York to California to Texas—that some of us are vying for key positions in the church and are helping to spread news that casts a poor shadow on our staff in public ways which should be dealt with in confidence. I cannot speak to the truth of any of that, but I do know that is what I am being told by pastors, and middle governing execs, and even seminary staff. And for us to do the work we are called to do, we need to name and address these matters. My friends, God has called us into the communion of fellowship known as the PC(USA). In a spirit that reflects who we are as responsible followers of Christ, let’s start looking at ways to lead our denomination into our new reality. Let’s find ways to make God smile. And remember this most of all: We have every reason to believe that God loves our church, because it is in God’s hands. And God also loves each one of us—so much that it’s as if God had nothing else to do. The 221st General Assembly of the Presbyterian Church (USA) met June 14-21, 2014 in Detroit, Michigan. It was an honor and privilege to serve as a Ruling Elder Commissioner at this national level of our denomination. This was my second opportunity to serve in this role. My first was in 2002, the year in which the 214th General Assembly, over my objections, voted to shift from annual to biennial meetings. Well, I did not get my way on everything in Detroit either. There were several ‘hot button’ issues on the agenda in Detroit. Prayerful, committed, Presbyterians showed great passion for their views, often on opposite sides of a particular issue. As much as I wanted to be objective and rational and dispassionate in casting my votes, that was not always possible. I experienced physical discomfort in casting several votes. In the weeks following the 221st General Assembly it has become clear to me that subtle nuances of wording and thoroughness of debate do not matter to Presbyterians in the pew nor to the public in general. All that matters is which way the vote went and how that result is communicated. Here are my phrasing of some of the highlight decisions. Took the final step to place an improved translation of the Heidelberg Catechism into the Book of Confession. Provided immediate discretion/flexibility for pastors and sessions to decide who can be married. Elected a new moderator, Heath Rada, on the first ballot (a rare happening). Recommended reducing the number of synods to between 10 and 12. Dissolved one non-geographic Korean presbytery composed of 23 churches. Reaffirmed the goal of two states for two peoples. Changed PCUSA investment policy regarding three US companies as a symbolic statement of concern for the plight of Palestinians. Remember, we are the General Assembly. Try it yourself in 2016. It would be my pleasure to accept an invitation to speak with you individually or in a group and share more details of my experience of eight days in Detroit and the issues themselves.